Need a recipe that works for lunch, brunch or supper? 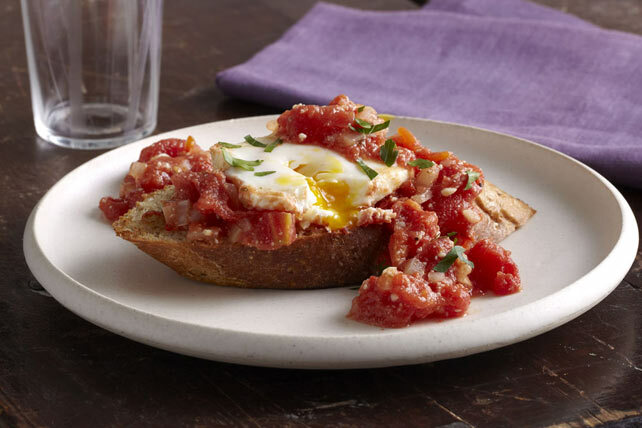 Our Poached Eggs Italian Style is an egg recipe with versatility! Serve this tasty egg dish with a crisp green salad to round out the meal. Heat oil in medium skillet on medium-high heat. Add onions and garlic; cook and stir 5 min. or until onions are crisp-tender. Stir in next 3 ingredients. Bring to boil; simmer on medium-low heat 20 min., stirring occasionally. Break 1 egg into small bowl; gently slip into tomato mixture. Repeat with remaining eggs; cover. Cook at a gentle simmer 10 min. Remove from heat. Uncover; let stand 2 min. or until whites are completely set and yolks begin to thicken but do not become firm. Use slotted spoon to transfer eggs to toast slices. Stir Parmesan into sauce; spoon over eggs. Sprinkle with parsley. This tasty dish, made with better-for-you products, can help you eat right!